Being in the microbrand dive watch space, Ocean Crawler is no doubt swimming in crowded waters. Their watches, unlike many brands, strive to be unique in their designs and they’ve truly built a style all their own across their releases. Within the microbrand world of watches, I think there are two things required to make for a watch worth your money – the first is that it has a unique design that isn’t just an homage, and the second being manufacturing quality that matches up with its price point. While I’ve gotten the chance to own and handle a lot of different microbrand watches, not all of them fulfill those two criteria for me, and others far exceed expectations like offerings from Monta or Halios. Competing in this landscape, is the Ocean Crawler Ocean Navigator Watch, a quirky titanium-cased diver with some esoteric design aspects. 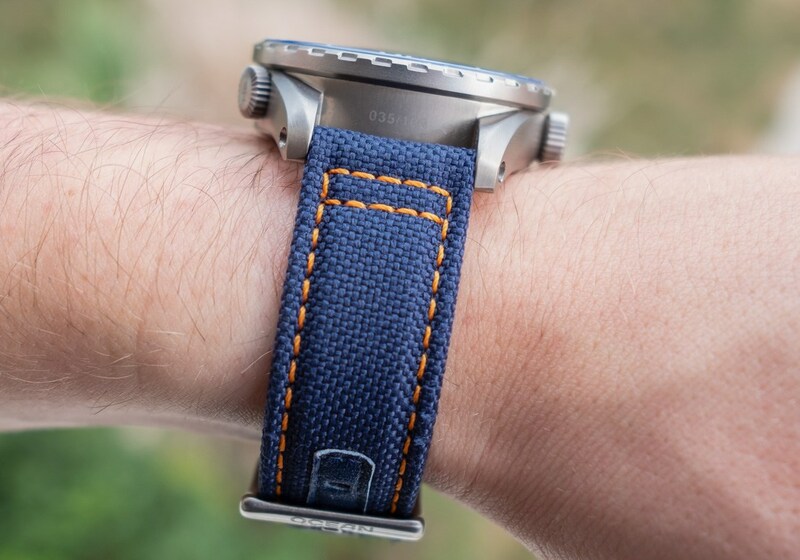 When I first strapped this watch on the wrist, I wasn’t quite sure what I thought about it. The case, while light, is large, the dial is bursting with color, and there are three large crowns protruding off the case. After a few weeks on the wrist however, I grew to really enjoy this piece for what it was. 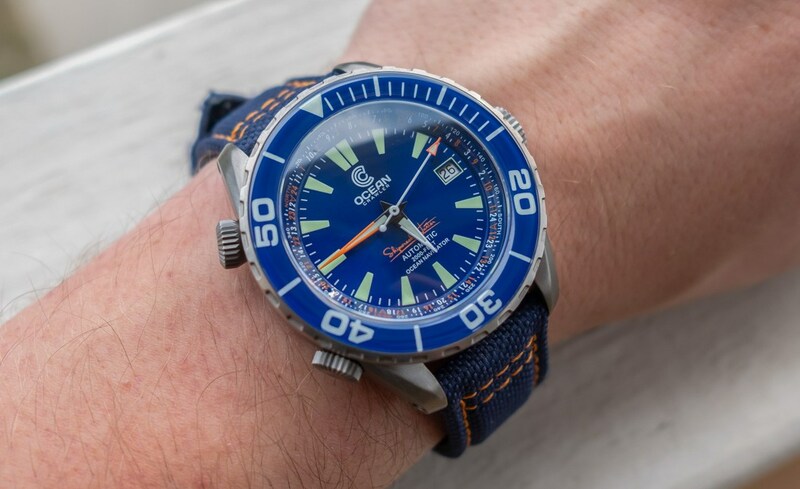 Let’s take a closer look at this new diver from Ocean Crawler. Measuring in at 42.9mm in diameter, excluding crown (45.9mm including crown), 14.67mm thick, and a lug to lug of 50.3mm, the Ocean Navigator commands a large wrist presence. It at first threw me off, because despite the larger size of the watch, the Ocean Navigator isn’t heavy or bulky on the wrist like other large cased divers I’ve tried. This is thanks to the case being made out of a nice, lightweight titanium. Coming from the EDC world, titanium holds a special place in my heart, and I’m always glad to see more titanium watches. One aspect here that I really appreciate, is that Ocean Crawler opted for more of a satin finish to the titanium, rather than a fully muted, blasted finish that many manufacturers use with titanium. This allows the darker color and personality of the titanium to really come through. While titanium is lightweight and awesome, one unfortunate downside of this metal is that it is prone to scratching much more so than stainless steel, and will definitely show more wear. The case finishing overall is well done. There are some nice design elements here like the smooth beveled edges to the lugs that give it more personality. All around there are no sharp edges, everything is nice and smooth to the touch. As you look around the case, you’ll no doubt notice the 3 crowns jutting out from seemingly all sides. This is a design choice that took me a while to get used to, but after a few days on wrist, I don’t really notice them. And of course, living up to its name, the Ocean Navigator is water-resistant to 600m. To break it down, the primary crown at the 3 position is used to wind the watch, and set the time/date. This crown is the largest of the three, and has a nicely done finish to it that reminds me of some of the older Stowa Flieger crowns. The machining here provides a lot of grip without being sharp or uncomfortable against the wrist, and capping it off is an engraved Ocean Crawler logo. Moving to the left side of the case, the top crown adjusts the internal rotating compass bezel, and features the same milling and engraved logo. Moving down the bottom crown is the helium escape valve. Now, I know the inclusion of an HEV will get some people upset, as it really isn’t necessary for 99% of people, divers or otherwise. I have no issue with the HEV, despite never planning to use it, but your experience may vary. 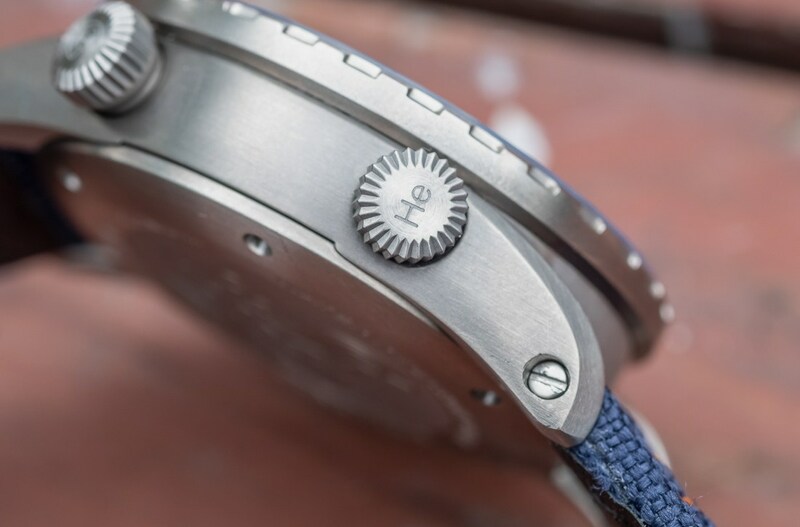 The HEV crown is aptly marked with an engraved “He” rather than an Ocean Crawler logo. Rounding out the case, the caseback is also made of titanium, and is engraved with the Ocean Crawler logo, a trilobite, and basic details about the watch. It would have been nice to see a display caseback here given the price point of this watch, but this very much so is not a deal breaker in my book. The dial of the Ocean Navigator is, in one word, busy. To clarify, I don’t think that’s a bad thing but it’s worth considering. 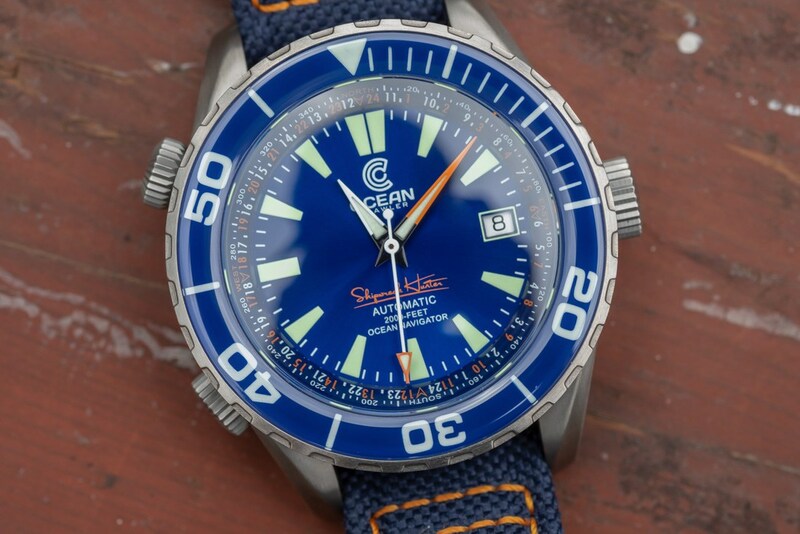 Amidst the sunburst blue dial, logo at 12, 4 lines of text on the lower half of the dial, hour markers, minute markers, date window, orange accents, orange hands, and internal compass bezel, the Ocean Navigator can be a bit overwhelming at first glance. It took me a few days on wrist to really gain an appreciation for the design elements here. Despite everything going on with the dial, it still remains balanced. No element overpowers another, and it all comes together for a nice tool watch aesthetic. To look a bit closer at the dial, we have trapezoidal painted markers at each hour, with the exception of the 3 position, where the date window is placed. I always appreciate having a date function as I find it useful, but it would have been nice to a color matched wheel, rather than white. Up at the top of the dial, we have the large Ocean Crawler logo, and at the bottom of the dial, an additional 4 lines of text. This is a bit much for my taste, as I tend to prefer a cleaner dial, and some of the information presented here is a bit unnecessary. In orange text it states in a cursive font “Shipwreck Hunter,” then “Automatic” in a non-cursive white font, then “2,000 feet” as the depth rating, and then below that “Ocean Navigator.” All of this same information is printed on the caseback and could be found there, and I’m confused at the choice to make “Shipwreck Hunter” the largest, most stylized text, and the actual model name at the bottom in the smallest text. All this to say, overall, I do really dig the dial design of the Ocean Navigator, especially in this blue colorway. There’s a nice amount of color with the orange minute hand and orange tipped seconds, and the sunburst blue dial gives this dial a nice bit of personality. All the hands and hour plots are lumed with C3 Super-LumiNova, as well as the rotating bezel, and covering the dial is a sapphire crystal. Overall, I found this to be a very fun watch to wear especially seeing as it’s summer time at the time of my testing.